Thimbles--Thimble is a small hard pitted cup worn for protection on the finger that pushes the needle in sewing. Chinabead.cc can offer thimbles in different material, styles and patterns for your selection. 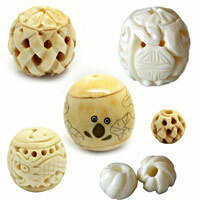 They are not only thimbles, but also exquisite artwork and can be collection or as gifts. Be sure to check each of them , you will love these fancy thimbles! NOTE: Our Min. order is for each color each size. China beads accept OEM/special orders. Contact us now!